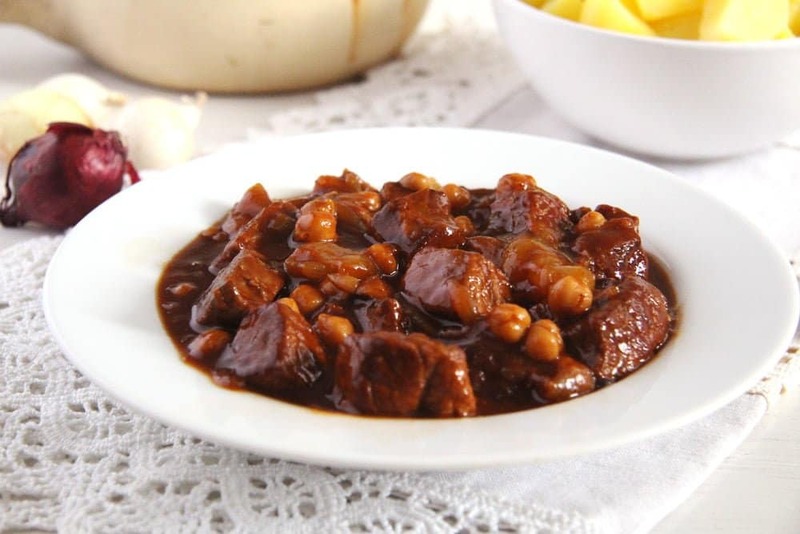 A hearty pork stew with pearl onions and chickpeas in a luscious slightly sour sauce, comfort food for these grey autumn days. 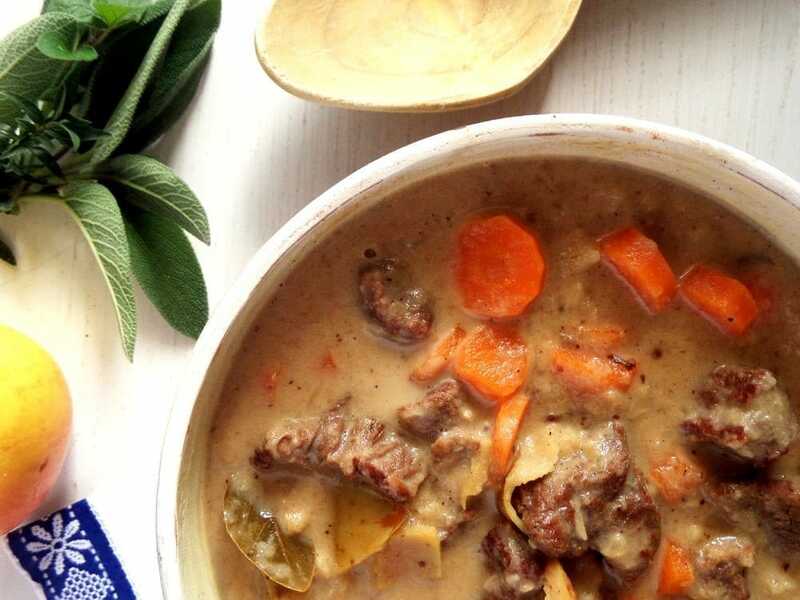 I love a good stew, especially when the weather gets wetter and colder. 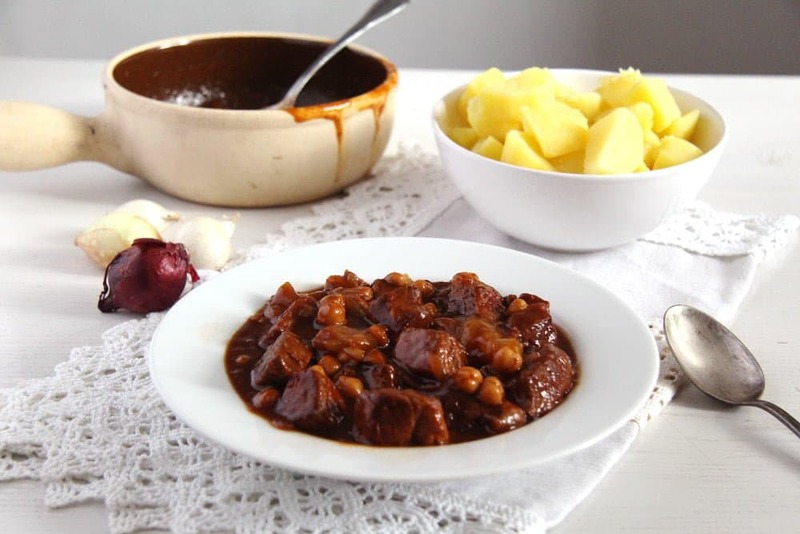 I grew up with them, stews (tocana/mancare de) seem to be the heart of Romanian cooking, not only the kind of meat stew one would expect, but also lots and lots of vegetable stews. I would say the Romanians are world champions in making stews with any kind of meat, pulse or vegetable you could think of. I don’t make them that much myself nowadays, but when I do, I am always happy. 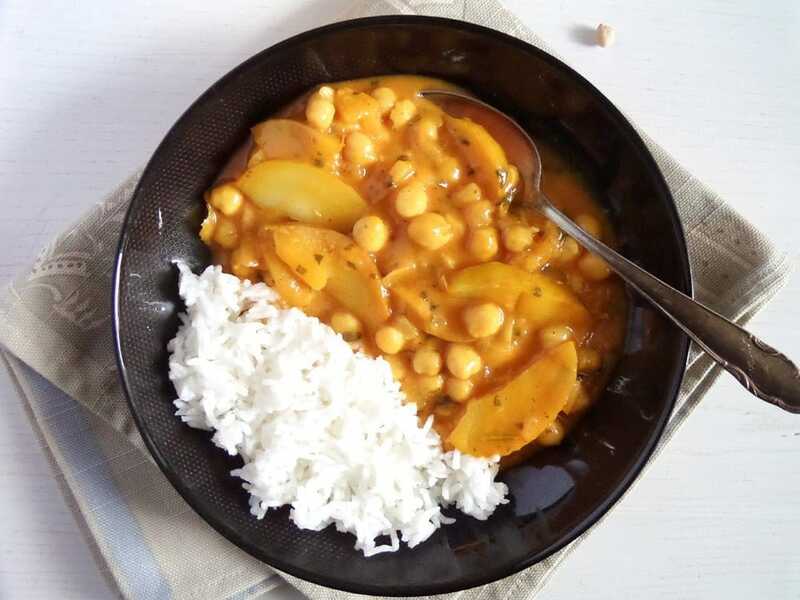 A good stew can be so comforting on a cold rainy day, it warms you up from inside and leaves you wishing for nothing more. 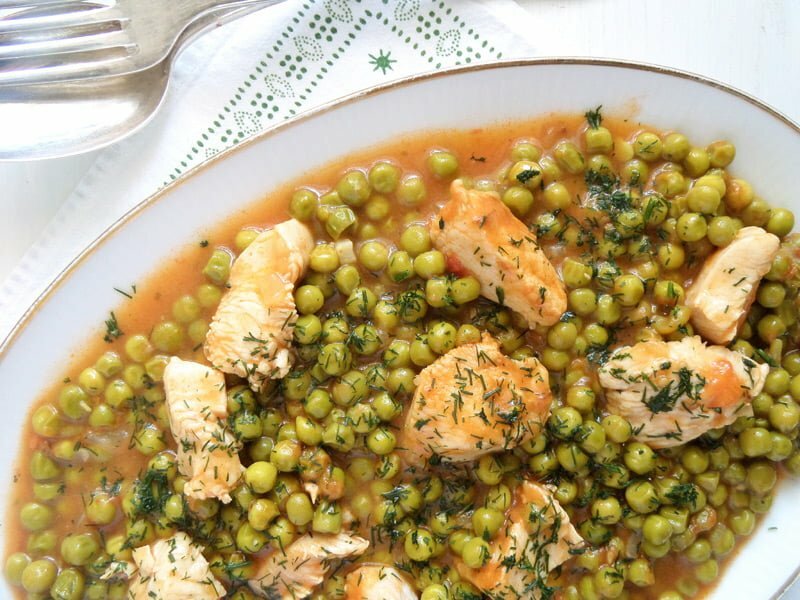 This particular recipe is a bit of a twist from a classical Romanian stew. Firstly, the use of chickpeas. We do have them in Romania but, as far as I know, they are not widely used. At least not in the area where I grew up. But I like them so much and I use them often, in this case to replace the beans any good Romanian would have used in this situation. I like beans too, but my children prefer chickpeas to beans, that is why I end up cooking way more chickpeas than beans. To match the use of chickpeas, which for me have a Mediterranean/ Middle Eastern touch, I spiced up the stew with some hot red pepper paste and a tablespoon of pomegranate molasses. That gives the sauce a slightly sour-hot taste. If you don’t happen to have the molasses, you can replace it with 1-2 tablespoons fresh lemon juice (to taste). And of course: the bone broth. Like every other recipe these past two weeks, I have made this stew using beef bone broth. 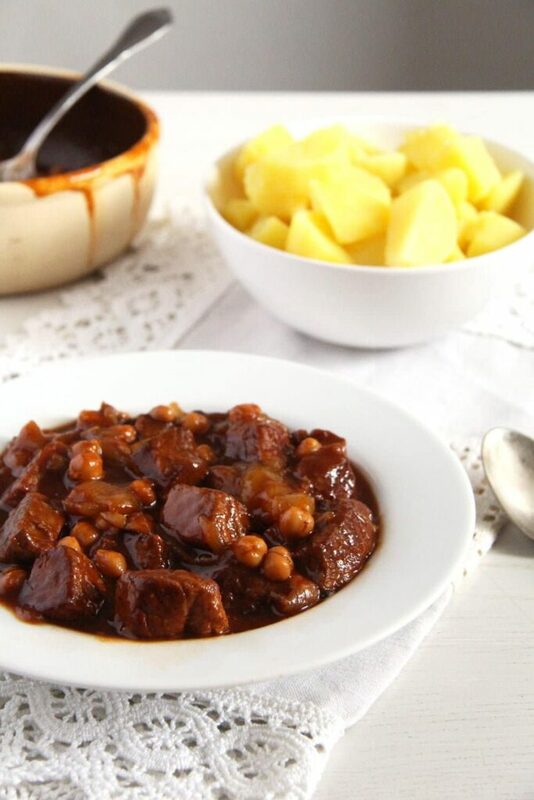 That gives the stew really a new dimension, a depth of taste which could not be achieved by using just water. I can strongly recommend to make a big batch of good beef or chicken bone broth from once in a while and freeze it in smaller portions, which you can use later to make any kind of delicious soup you wish and lots of stews, sauces and so on. Bone broth is said to have a good influence on your health as well, if you would like to know more on this subject you could read this article. If you don’t have the time to make your own beef bone broth, here is what I like: Kettle & Fire‘s organic beef bone broth. 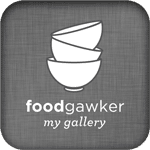 If you wish to buy their product, don’t forget to give the promo code MYSPOON15 with your order and you’ll get 15% off your first order. Pat dry the meat cubes with kitchen paper. Heat the oil in large heavy-bottomed stewing pan and brown the meat cubes, in two batches, on all sides. That should be made on a high heat. In the meantime peel the pearl onions. Heat the beef bone broth. Give all the meat back to the pan and add the tomato paste and the red pepper paste, stir well and cook, stirring often, for 2-3 minutes. Add the hot bone broth, pomegranate molasses, salt and pepper. Stir well, then add the drained chickpeas and the peeled onions. Bring to a boil, turn down the heat and simmer for about 30-40 minutes until the meat and the onions are tender. If necessary, thicken the sauce with the corn starch. Mix the corn starch with a little bit of water and stir the paste into the sauce while whisking all the time. Stir well and bring to boil again. Turn off the heat as soon as it boils and stir well. Adjust the taste with salt and pepper. This looks unbelievably good!! 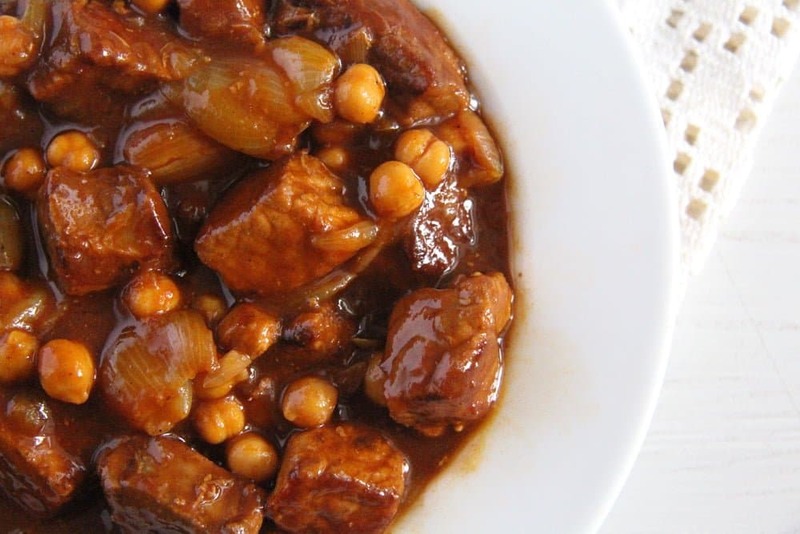 I just love the combination of pork, pearl onions and chickpeas. And love how you added hot red pepper paste. I bet that pomegranate molasses adds such a richness too. I would love to curl up with a big bowl of this and big hunk of bread for dunkin’, especially since it’s raining here today 🙂 Pinned! This looks so good..I first thought you used chestnuts…but chickpeas sound like a great pairing too. 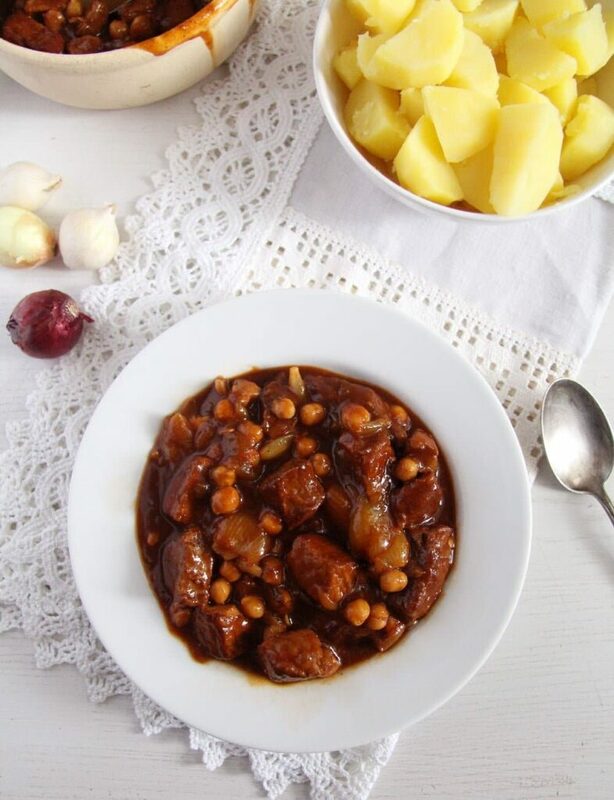 This recipe sounds delicious with chickpeas and good amount of pearl onions. What a hearty looking stew. Is there anything better in winter? I love how thick that gorgeous sauce is! This sounds wonderful. I love the beautiful mahogany-hued sauce!